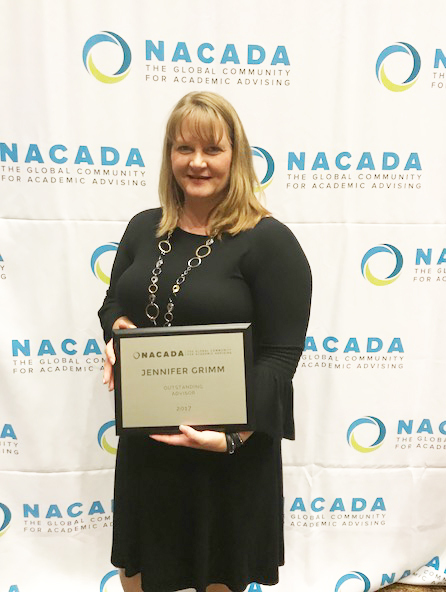 MACOMB, IL – Western Illinois University Department of Communication Academic Advisor Jennifer Grimm accepted the Outstanding Advising Award – Primary Advising Role by the National Academic Advising Association (NACADA) during a conference in October. Only between 5-10 of these prestigious awards are given annually. The award is given to an individual who has demonstrated qualities associated with outstanding academic advising of students. The Academic Advising – Primary Role category includes those whose primary role at their institution is the direct delivery of advising services to students. "We are extremely fortunate to have Jennifer as a member of the department of communication here at Western Illinois University," said Communication Chair Peter Jorgensen. "I can wholeheartedly attest to the fact that Jennifer consistently performs at a level that surpasses normative expectations in the execution of her assigned job responsibilities within our department. Jennifer does not simply 'do' her job on a daily basis; she actively seeks to excel in that job in a manner that is both consistent and exemplary." Jorgensen added that Grimm's students are grateful for her personal interest and concern. "The students clearly cherish the relationships they have made with Jennifer, and those relationships are a critical element in promoting student success and retention in our department," he said. Grimm is the first WIU advisor to receive the national award since 2005. "She has performed her assigned responsibilities with the utmost professionalism and grace, and contributed greatly to this department not only in terms of advising and recruitment but also with regard to improvements in departmental curriculum and to the functioning of the university as a whole," said Jorgensen. "Her willingness to become involved at various levels of this institution is greatly appreciated, and her talents and skills are held in high esteem by all of those with whom she works." NACADA provides a network and professional identity for the thousands of faculty, full-time advisors and administrators whose responsibilities include academic advising. For more information about the organization, visit nacada.ksu.edu.